It’s been rather quiet on this blog for a while – but I’m very happy to announce the release of the 7th (and final!) 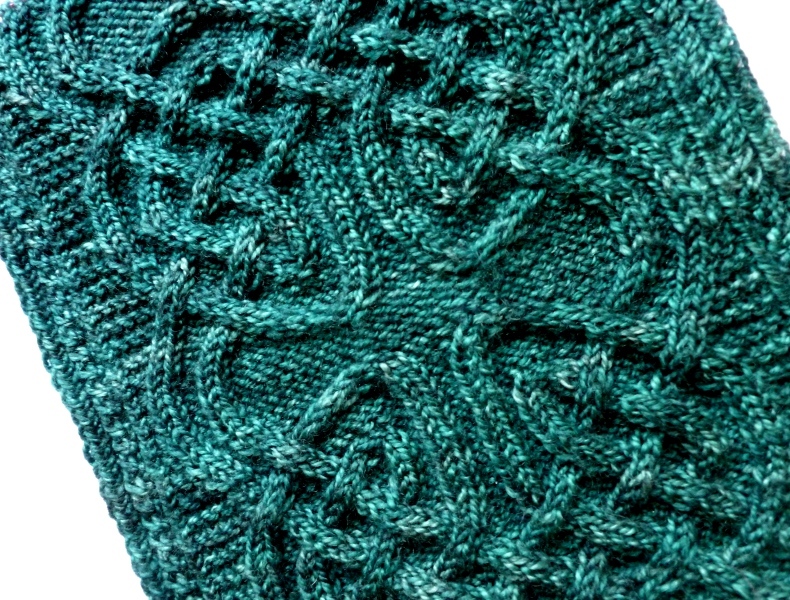 shawl pattern in my Celtic Cable Shawls collection: Ishneich! 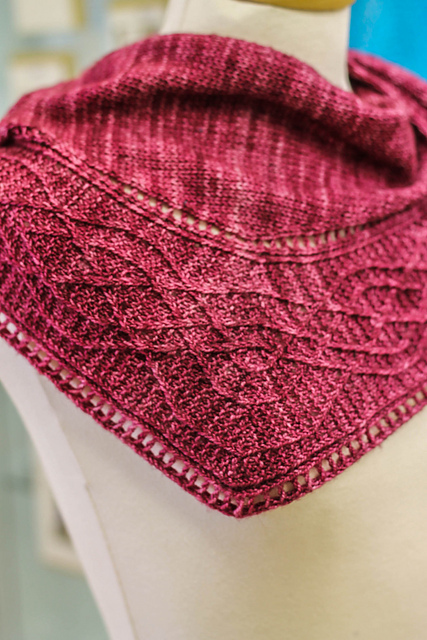 Ishneich is a top down triangular shawl pattern, designed to work well with a variegated yarn and a contrasting semi-solid (or solid) yarn. The variegated yarn is used in the body, and broken up with stripes of the semi-solid, which is also used for a cable border. I used two gorgeous shades of Malabrigo Sock, which I picked up on a lovely trip to The Yarn Cake in Glasgow, the day before my birthday (back in March). When I picked the shades originally, I wasn’t planning on using them together, as I didn’t think they would match, but once I tried some stripes, I was surprised by how well the colours worked together – it’s funny how that can happen sometimes! I wanted to take this opportunity to also give an update on the progress of the book. 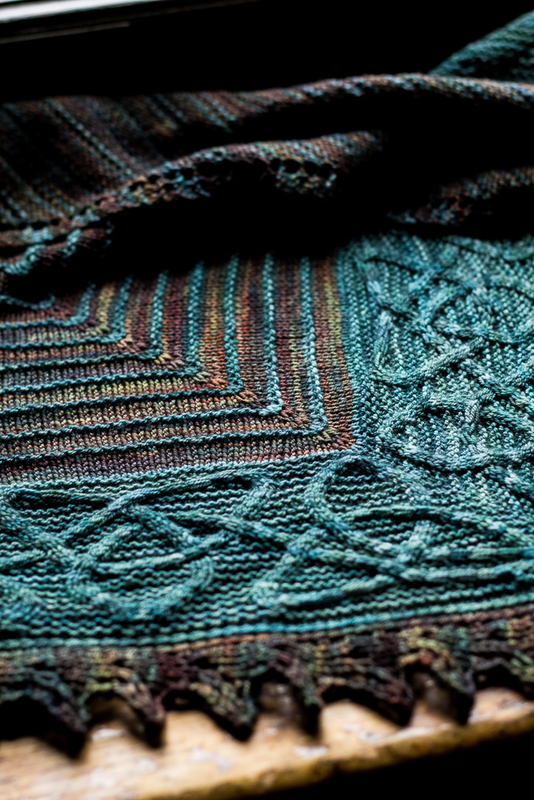 Celtic Cable Shawls is going to be released in print format (together with an update to the e-book version – so if you already have the e-book, you will also receive the PDF version of the print book, once it’s ready). I have had many queries asking me about a publication date, and I’m really sorry to say that at the moment, I can’t give an exact date. I am self-publishing the book myself, and doing most of the work myself too, including layout and photography. I’m also working with a graphic designer to produce some tutorial diagrams, as well as with a couple of freelance tech and copy editors. At the moment, all the photography for the book has been completed, and all the pattern are finished too. The diagrams are in the process of being completed. The main work left to do is all of the layout, all of the final editing, and also some introductory text that I need to write. So, it’s close to finished, but I’m reluctant to give an exact date, because co-ordinating a major project lik this is a bit of learning curve for me – I’m working with Lightning Source to print the book, and I’m not exactly sure how long everythinig will take to get ready once I submit the final file to them. I will update this blog as soon as I’m able to give an exact date of release (you can also sign up to my newsletter, if you would like to be the first to hear about any news!). I know a lot of you have been waiting patiently for the print book for quite some time, and I’m really sorry to not be able to give you an exact date yet – thank you so much for your patience, and for your interest in the book too. It’s really very much appreciated! 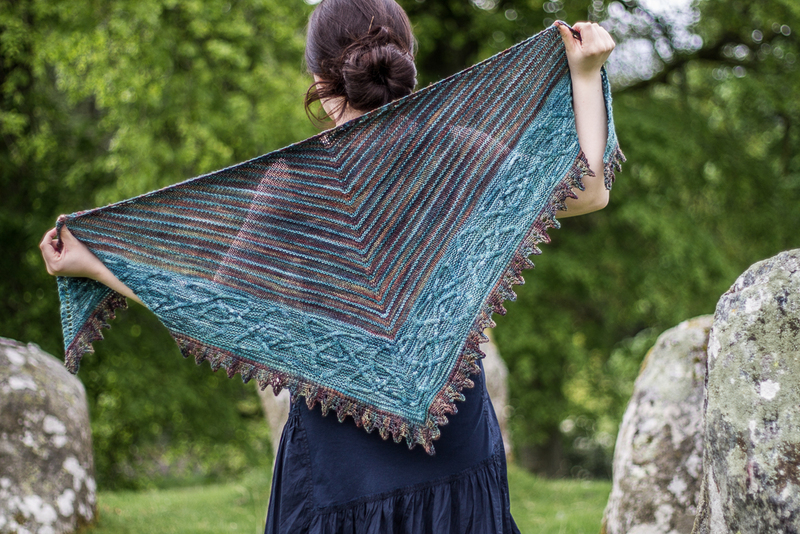 Kyna shawl + Celtic Cable Shawls – a rather exciting announcement! 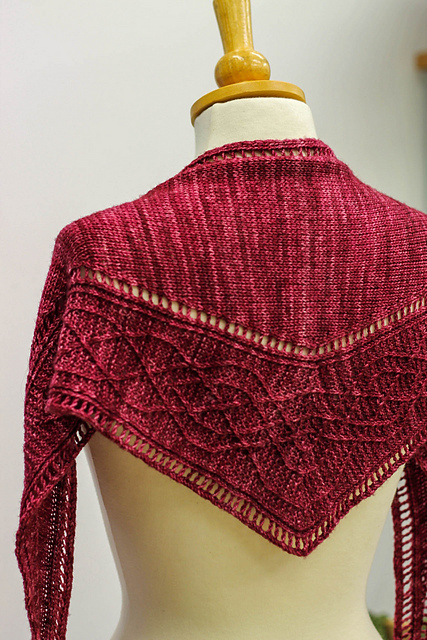 I’ve just released a new shawl pattern – Kyna, a sideways triangular shawl with a twisted-stitch cable edging. Now for the exciting announcement bit – this design is actually the second design in a collection of shawl patterns that I will be releasing in e-book format – and print too! Yep, I’m doing a book! The e-book version is currently available for pre-order on Ravelry – when you pre-order it, you will get all the patterns currently released (at the moment this includes Taliesin and Kyna), and then you will receive the rest of the patterns as they’re released. There’ll be a total of 7 designs in the completed book. Because Taliesin was released way before I announced the collection, I have set things up so that if you purchased Taliesin on Ravelry, the full cost of this pattern will be deducted from the cost of the e-book (note that you need to be signed in to your Ravelry account, and click ‘add to cart’ on the e-book source page for this to be applied automatically!). If you’d rather get this book in print, then stay tuned – I will announce details of the print pre-order soon, and a complementary copy of the e-book will be included with every print book pre-order. Lots more information here on my website!